Several heritage breeds thrive at Lippitt Farmstead, including Narragansett turkeys, Milking Shorthorn cattle, and Merino sheep. 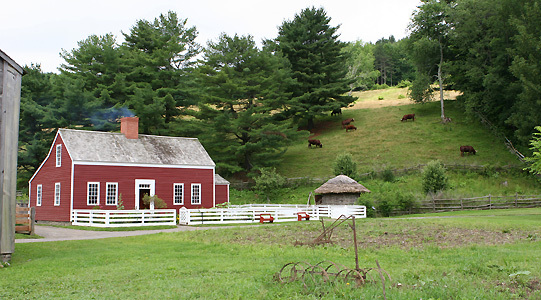 The Lippitt Farmstead is a living example of how a farm would have operated in the mid-19th century. Seasons are celebrated at the farm with the changing scene and changing occupations: cultivation and harvesting of hops, the area’s most valuable crop of the period; nurturing of young farm animals; shearing the sheep and combing, spinning and weaving the wool. Children will delight in petting or feeding the young animals in the Children’s Barnyard. The farm is welcoming, friendly and hearty, a tribute to the pioneering spirit that shaped the American countryside. The farmstead includes two barns and six other outbuildings, animal sheds, a smoke house, and the Lippitt family farmhouse. The farmhouse reflects the design of houses in Joseph Lippitt’s native Rhode Island. The house dates from 1800 and was built in Hinman Hollow, N.Y.